Are you truly happy with the life you’re living? Do you feel content with the way your mind works and how you think? Chances are you aren’t. In fact, studies show that more people are victim to negative thoughts than they realize. Negative thinking is often the root of many problems that we face, both physical and mental. Do you fall into this category? Even if you don’t think so, do you feel that you are living your life to the fullest? Are you truly at peace with yourself and completely happy about how you feel and view things? If you answered no to any of the above questions, this means that to some extent, negative thinking has taken root in your life. What if I told you that you could stop negative thinking and live the best life possible? You can have the life you want – the job, the success, the wealth, and the relationships. Would you be excited about that? Well, it is possible and it’s much easier to achieve than you think. You can find the answers to all your mood and emotional problems in my e-course, “30 Days to Positive Thinking”! Interested yet? 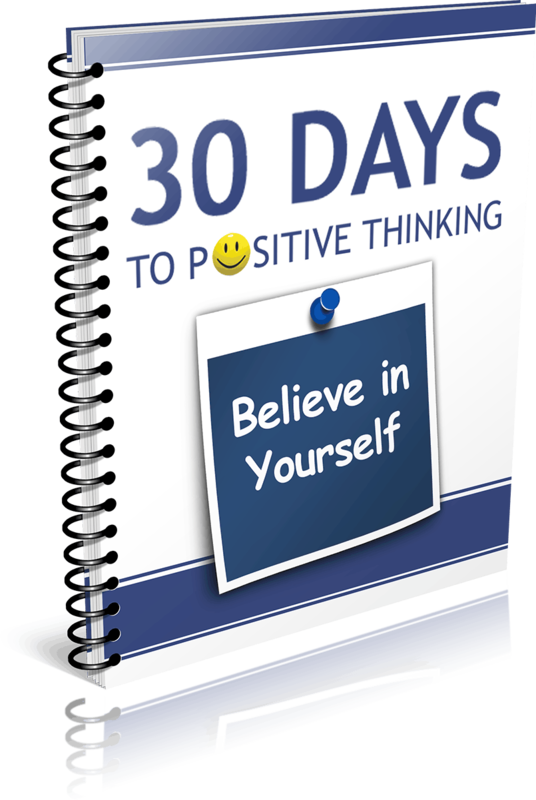 What is “30 Days To Positive Thinking”? “30 Days To Positive Thinking” is an e-course that I developed to help you take control of your thoughts and learn to think positively. It’s a game changer, one that can completely redefine your life once you’re finished. Once you learn to think positively, your outlook and your life will change for the better. The best part is, you’re the one who gets to define what that “better” is. With this 30-day course, you are going to receive lessons and the support needed to stop thinking negative thoughts and thinking thoughts that will lead you to a more prosperous life. 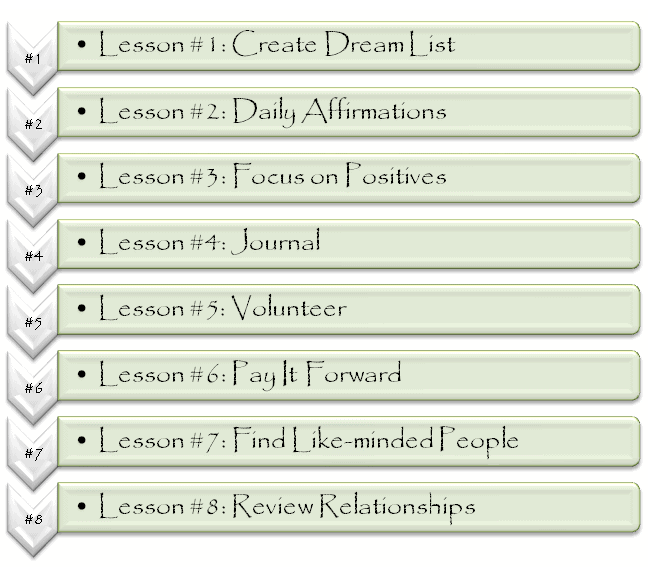 The 30 day course consists of 8 Action Lessons. Every few days you will receive a video email from me that includes the current lesson. These videos are roughly 5-10 minutes long and teach you a new skill to focus on over the next few days, along with an action plan. In between lessons, I will be sending you additional emails to help solidify the lesson and push you through any sticking points you might be facing. If at any point during the course you have questions or need guidance, I offer 100% free support. The power to change your life is resting in your hands right now. You no longer have to be confined to the mental prison that has held you captive for so long. You can break free, right now, and here is your chance! Will you take it? Over the course of the past year of offering this course, I have had a handful of questions from students. Below are the most frequently asked ones. Q: What am I going to learn in the course? A: You are going to learn how to start thinking positive thoughts throughout your day. When negative thoughts come into your mind, you are going to learn how to quickly “flip the switch” and focus more on the positive side of things. This might sound basic, but is am important step if you want to be the best you and the best life possible. Q: Can I do this on my own, without the course? A: You most certainly can. The problem the course solves though is showing you exactly how to change your thought pattern. The plan you follow with my course will get you there in just 30 days. Most of us can’t completely change our habits all at once. We need to take smaller steps in order to succeed. This course does just that – it gives you bite size pieces to ensure success. Q: How much time is needed to complete the course? A: I understand that we all live busy lives. As a result, I have made it a point to keep all of the lessons short – 5 to 10 minutes max. From there, you decide how much time you want to invest in creating your best life. Obviously, the more time you commit, the more you will get out of the course. But again, you aren’t going to have to devote endless hours. Some topics will require more time than others however. Q: What can I expect my life to be like after completing the course? A: After completing the course, you will have to continue work on thinking positively. It’s not like surgery where a cut is stitched and you can go about living your old life again. The good news is that as time goes on, thinking positively will become easier and easier and you will get to the point where you don’t have to think, you just do. Q: Do you really provide support as needed? A: Yes! I want you to succeed. As a result, I make the time to respond to any of your questions. I check my email account twice a day, every day. Rest assured that even if I cannot answer your question right away, I will respond, letting you know I did receive your email and when you can expect a reply. A: Yes! I offer a 100% money back guarantee for 60 days. If you aren’t completely happy with the course, simply email me, tell me what you didn’t like and I will refund your money. If you’re ready to start reaching your goals, you can go through the purchase process below. Once you click “Buy Now” below, you’ll be taken to a secure checkout screen at PayPal where you can purchase this entire course for just $17. As soon as your order has been processed, you will receive a welcome email from me that introduces you to the course and prepares you for what to expect. You first lesson will be emailed to you the following day. The entire checkout and sign-up process will take less than five minutes. A life-changing 4-Week Program of 8 lessons that will help you change your thoughts and your life – forever. Comprehensive 30 Days to Positive Thinking email lessons that will guide you through the process, every step of the way. Free support with me should you have any questions, at any time. I am here to help you succeed. The total value for the program is $125. The course is reusable over and over and you are able to re-do the program at any point in time in the future. In fact, it is suggested to revisit the program at different stages of your life, since you will get something different out of it each time.